EOSPY Mobile — Executive Order EOSPY Mobile GPS Tracking System – An Android mobile version of EOSPY – Executive Order Sensor Processor sYstem Server. The EOSPY Mobile Android application allows you to use your mobile Android phone to monitor your GPS Tracking Device remotely. EOSPY Mobile is easy-to-use and helps you stay connected in “Real-Time” with your EOSPY GPS devices and IoT telemetry information. EOSPY Mobile provides seamless integration between your EOSPY Server live-map GPS Tracking Devices and your mobile phone. Connect to your EOSPY Server – Web application (Web app) is a server application that delivers EOSPY GPS information over the Mobile interface. The EOPYy Server main control window ties all location and environment monitoring information on one Mobile GPS Map screen. EOSPY – Executive Order Sensor Processor sYstem Server is designed to support as many tracking devices as possible from popular GPS vendors. Use EOSPY Mobile app for viewing “Real Time” live GPS Tracking information over the Internet/Mobile Cell network that does not require a monthly service subscription or fee. EOSpy Mobile provides information about any GPS GSM Tracking Device directly on your Android Smart Phone. EOSPY Mobile monitors buildings, vehicles and people from anywhere in the world. Stay connected and informed to what’s important. 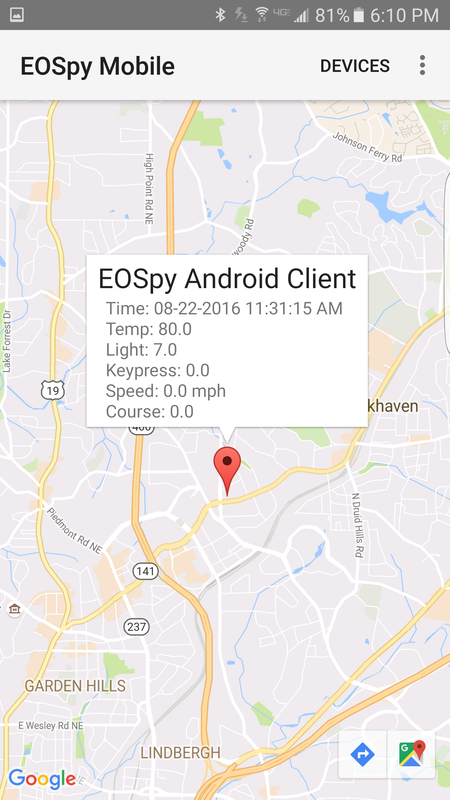 EOSPY Mobile show your GPS Tracking Devices on your Android phone map and receive Ambient Temperature, Ambient Light, and Simple Button Press information you’re your GPS Tracking Device. EOSPY Mobile can also receive IR object temperature, humidity sensor, pressure sensor, accelerometer, gyroscope, magnetometer, digital microphone, and magnetic sensor. EOSPY Mobile also has Advanced Reverse Geocoding – Geocoding is the transformation process of addresses and places to coordinates and is sometimes called forward geocoding whereas Reverse Geocoding uses geographic coordinates to find a description of the location, most typically a postal address or place name. EOSPY Mobile will provide you with the address of each GPS Tracking Device. EOSPY Mobile Advanced Reverse Geocoding – Geocoding is the transformation process of addresses and places to coordinates and is sometimes called forward geocoding; whereas Reverse geocoding uses geographic coordinates to find a description of the location, most typically a postal address or place name. EOSPY will provide you with the address of each GPS tracking device or EOSPY Android client app. Multiple Map Layers – EOSPY provides multiple map layers and Geo-view including high-resolution satellite imagery. Vehicle Location – EOSPY can check your vehicle’s current location, speed, and distance from your computer. All of this fleet information in a simple and intuitive GPS live screen with a live map. Current Connections – The map displays the number of current EOSPY GPS tracking live streaming connections. Remote GPS Information – Tracks when and where your vehicle traveled since you installed the app. Also, it shows the current address of that location with Latitude and Longitude. Update GPS Information – Check your vehicle’s speed, course and distance with continuous recording of events and history look up. Executive Order EOSPY Mobile – The GPS Tracking automation and remote monitoring system is a complete package for business or office. Its wireless GPS tracking allows you to monitor your office, systems, personal property, and business from anywhere in the world. Receive remote information from any number of events like when an employee arrives on-site or where a vehicle is located. 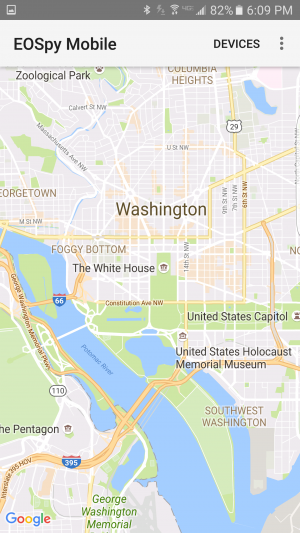 The Executive Order EOSPY Mobile unique product design allows live GPS tracking and surveillance all on your Android phone, without a costly monthly, third-party subscription service. The Executive Order EOSPY Mobile unique product design allows live GPS tracking and surveillance all on your mobile phone or tablet, without a costly monthly, third-party subscription service. You can visit the Google Store EOSPY mobile at Google Store to download the Free EOSPY mobile to your Android Device.